This entire situation was crazy. It was absolutely insane, in fact. And Calvin was not referring to the fact that he was currently in the form of a neon android; flying high in the sky at over ninety miles an hour. From the Everclade to Manhattan, it took a little more than a half hour for Calvin to complete the full journey. Thankfully, he’d long since set up a special extended version of this song in order to stay Harmonized in mid-flight, lest it end on him and cause him to suddenly plummet to his doom. And so here he was, flying along to the beat of Angel in the Night, hundreds of feet above the towering skyscrapers of New York City with no particular destination in mind. Calvin almost shook his head in mid-flight at his own duplicity. That was a huge lie. He knew where he wanted to go, and who he wanted to see. He just wasn’t sure how to go about it, and if it would even work out. Lights flashed by underneath Calvin as the sun began to set above the New York City skyline. Under this song effect, his eyes were replaced with metallic sensors made of far more durable stuff than his fleshy human eyes. A wealth of targeting information presented itself to Calvin, showing him the perfect flight path and the locations of various obstructions, among other things. He hadn’t yet tested it, but Calvin often wondered if he even needed to truly breathe oxygen in this form. He would have chuckled at the thought of going into space if he still had a mouth to laugh with. Much like Michael’s Dancing Machine, talking while in this song effect was not an option. Using his mechanical and focused gaze, Calvin finally found a spot to rest on a building below. He swiveled downward with the grace of a fighter plane, gaining speed as he did so. The wind whipped past the red and yellow wires that replaced his usual shaggy golden locks. Calvin only began to slow the closer he got to touchdown, turning on his thrusters to further stall his descent lest he crash into oblivion. He skidded to a halt on the roof of a small apartment building, red energy leaking from his hands in an effort to further slow him down. Calvin only relaxed once he had landed safely, and he was sure that he was completely alone on this roof. With but a button press upon a hidden compartment in his chest, Calvin’s robotic form quickly vanished, and he returned to his former human self. Upon transforming back, he made his first smile in the last hour, remarking over the convenience of having external speakers on this particular music player. Still, even he couldn’t deny the comfort of wearing headphones. Slid somewhat uncomfortably in his jacket pocket, they remained to be one of the only other things besides the clothes on his back that Calvin had brought with him from the Everclade. That, his new music player, and his phone. That phone was now in his hand, as he debated on one of the most difficult decisions he’d had to make in recent memory. Calvin stared at Michael’s number for a good minute before finally finding the courage to make his choice. He wasn’t shaking, but he certainly wasn’t comfortable as he put the phone up to his ear and waited for his former friend to pick up on the other line. It was a surprising six seconds before Michael Kay picked up on the line. Calvin had to imagine that the boy probably spent of all those six seconds staring at his phone in disbelief. The boy’s tone was indeed brimming with that same disbelief. Calvin put the phone down for a second, breathing deeply as he mentally prepared himself. It was good to hear Michael’s voice again, and to be reassured that he was indeed alive, but guilt remained to be a powerful force in Calvin’s mind. Nevertheless, Calvin’s voice came out in the most sincere way possible. And for once, it wasn’t all an act. There was a large part of Michael that sensed this was all one massive mistake. But an even larger part of him insisted that even after everything, Calvin deserved a second chance. He’d done some bad things, but no one was perfect, Michael thought. After all, Kim was far from welcoming and kind when they’d first met at the Dust Bowl all of those months ago. Michael waited on a bench, in a relatively empty skate park now that nightfall had finally come. The air was cold, as expected in the middle of January, but Michael had been in such a rush to leave and meet Calvin that he’d forgotten a jacket completely. He shivered, bare arms close together as he checked his phone and waited for Calvin to arrive. There was a reason, of course, that Michael had neglected to mention this little meeting to Aeris and Kim. If this really was another Zero Beat setup, then it would be his responsibility and his alone. So if he ended up dying because of his own stupidity, then that was one hundred percent his own fault. Certainly not the outcome he wanted, and one he would avoid at all costs, but that was Michael’s rationale on it at least. So for more than five minutes, Michael continued to wait. He checked his phone every thirty seconds, and still nothing from his former blond friend. Then Michael looked up, hearing distant footsteps as a newcomer approached him. The lack of light in the Dust Bowl made identifying this person difficult, and so Michael naturally walked towards this unknown person in an attempt to get a better look at him. “Calvin? That you?” he called out, only to stop mid-step as he scanned the figure top to bottom. Now he could see him, and he could see that whoever this this guy was, it wasn’t Calvin. It was instead a man wearing a trench coat, hands in his pockets and large headphones in his ears. From what Michael could tell in the dim lighting, he was completely bald. When he got closer, Michael could see his large, bloodshot eyes. The afro-headed teen gasped in surprise as the man suddenly swiped at him, and a song effect followed in his wake. The air around his hand distorted with destructive frequency as Chop Suey manifested, its user bounding forward and slashing like an animal in an attempt to get at hit on Michael. Michael stepped back quickly, ducking and dodging with his dance moves as his attacker only became more and more relentless. Quickly glancing behind him, the afro-headed teen ducked underneath a grind rail, hoping the barrier might serve to give him some small degree of breathing room. But as he found himself now cornered at a concrete junction, Michael could only widen his eyes as the man slashed downward, scraping away any hint of the metal rail that might block his way to his target. With that one swipe, it was as if he’d torn away that part of reality itself, leaving wrenched metal and emptiness in its place. Michael’s heart thumped in his chest. Echoes of their first fight here with Helia and Renaldo slammed back into his mind. He’d been right to listen to his gut. It was clear that Calvin had betrayed him once again. How else would this Music Master have known to find him waiting here? Michael Kay cursed his own stupidity, but he knew that from the way things looked, time was better spent on more important things. The world sure had a funny way of weeding out the gullible and unsuspecting, it seemed. When Calvin made his way into the Dust Bowl, the last thing he was expecting was a fight. But that fact just seemed fated to be, as he spotted the familiar bald head of Jimmy just twenty feet away and now holding Michael up by the collar. His free hand was open, vibrating against the air with its ability to cleave through reality itself. One swipe, and Michael’s head would be lopped off his shoulders with little effort. Chop Suey would be his funeral song if Calvin didn’t do something about it right now. Quick as he could, Calvin calculated the odds and options of the situation in his mind. He didn’t bother calling out to Michael, for it would only waste time. Instead, he mentally tracked the distance on the concrete ground between him, Jimmy and Michael. Harder, Better, Faster, Stronger would serve to only annoy Jimmy before he finished Michael off. Genesis would take too long, as would We Come Together and Angel In the Night. Transformative effects always had extra startup; it was the expected price for their summoned power. And even if he had the time to channel any of these songs, there was no guarantee Calvin would be able to fight Jimmy’s reality-scrape and just leave unscathed. Unfortunately, he had only another split-second to make a decision. Calvin’s finger moved to tap on his music player, hitting fast forward four times in succession to a song he’d only used once before. In all honesty, he didn’t actually know what it did. All he knew was that it grabbed at someone nearby, and pulled them towards him. The most sensible guess for its ability would be telekinesis. And so Calvin pressed play, in the same moment the Jimmy’s fist closed as he aimed a punch right for Michael’s stomach, intent on disemboweling the boy completely. He was just about to graze fabric and skin right when Calvin Harmonized. In that instant, the blond boy’s target was none other than Michael, as he focused the pull of his song effect to bring Michael right towards him. And Michael did come, but not at all in the way he expected. Two singers united as the electric-dance beat rose into the air, and consequently, so did two Music Masters. It all happened within a few blinks, as Michael’s entire body suddenly shifted into swirling, orange magnetic sound tape that surged towards Calvin’s location at remarkable speed. And at the exact same time, Calvin felt a similar change, his own body shifting into blue sound tape before veering towards his orange fellow. Jimmy turned around, caught in surprise as the two bands of sound tape wrapped together like fighting serpents. Chaos and disagreement reigned, if only for a moment, before settling into peace. The tapes melded as blue and orange light shifted into technicolor glory. A figure touched down, clad in a bright rainbow suit, short dreadlocks, and a knowing grin that echoed Michael Kay and Calvin Altberg alike. They braced for his attack, only for Michael to quickly realize the first advantage of this shared form once Jimmy got close enough. The bald-headed Music Master went for a right hook, aimed to take off an arm, but Michael swayed to one side, moonwalking quickly as he dodged it with little effort. A grin widened on his face, as he realized that whatever this shared body was, it could use the same dancing skills that Michael practiced and perfected on a constant basis. “Look, I’m only here to kill one of you. You just had to go and complicate things, didn’t you?” Jimmy complained as he launched another punch, only for the Move Your Feet-borne fusion to dodge it just as easily. For the moment, it appeared Michael was control. Both his and Calvin’s minds swirled in the same vat of consciousness, with either one able to hop in and take control at any moment. But right now, only Calvin’s thoughts were open and public, thus forcing him to make a guess that this particular song effect would allow him and Michael to share elements of their unique powers through this strange fusion of selves. Jimmy brought both hands downwards to bisect anything in their way, and this time, Calvin reacted. He thrust both hands forward, and pixelated fire burst forth. It pushed Jimmy back with its streaming force, burning his trench coat and forcing him to roll aside in an effort to put the flames out. Thankfully, that distraction gave Michael and Calvin more than enough time to finish things. They saw their chance in unison, dashing forward as burning pixels emitted from their heels in the process. Jimmy shuffled up, but he had only two more seconds to make any movement, before a gathering of pixels made their way towards his exposed headphones. With a quick motion, they engorged upon them, bursting into flame in the next moment. Cracks and sparks accompanied the destruction of Jimmy’s music source, causing him to throw his headphones aside as the noise of Chop Suey finally ceased. Calvin and Michael both smiled with satisfaction, their fusion following suit as he stepped towards the now downed Jimmy. He put his hand forward, 8-bit flames licking outwards at the air as his voice came out like some digital scramble. Jimmy nodded quickly, and spoke even quicker. He was up and standing in the next second, running past the Michael-Calvin fusion as quickly as his feet could take him. He wasn’t about to test his luck at second chances, that much was clear. They both looked back as Jimmy fled, only for Michael to finally realize the calm as he could simultaneously feel his friend’s thoughts. “Thanks, Calvin. That was a nice save.” he commented, the voice of their fusion now sounding more akin to his own. “I should be thanking you, Mike.” Calvin’s half responded, trying to somewhat hold back stray tears. He wondered if they’d both just end up crying combined like this. Michael grinned through their shared form. Sirenia’s voice was clearly agitated, as she leaned against the wall of the same VIP room that she and Calvin had first encountered Jimmy more than a week ago. Here they might have privacy, as Jimmy relayed the events of the previous hours with almost drug-addled speed. Jimmy was sitting on the couch, hands clasped together as he hung his head low. Tonight would mark the second situation he had just barely skirted his way out of. Jimmy put his head down again. When his gaze was no longer on her, Sirenia’s fingers went for the music player in her pocket. They didn’t yet touch play however, preferring to wait this one out if anything. “Unless it was some lookalike, yeah, he was alive as ever.” Jimmy replied. A few feet away, Sirenia mulled over her next course of action, words drifting out in the process. Jimmy kicked the table in front of him, his demeanor finally breaking in response to Sirenia’s snide remarks. “Alright, you’re shutting that mouth right now, or I’ll shut it for you. I did your job, so we’re good now. You understand?” he told her, standing up now as anger seethed through his expression. But Sirenia remained calm despite the threats. Her voice was just as calculating as always. Sirenia didn’t move an inch, even as Jimmy turned to stare her down further. Instead, she tapped play on her music player. Jimmy’s eyes widened as she Harmonized, forming the familiar graffiti-styled gun that had frozen him against the wall only days before. She pointed it at him without care, and it was at that point hat Jimmy knew that his time was truly up. A frigid blast of cold, created from Ice Ice Baby, burst forth from the weapon, washing over Jimmy completely. Like a self-contained blizzard, he was exposed to it now in full force. He could only move a few inches before the deathly cold claimed his muscles and had him frozen in place like some living ice sculpture. Jimmy moved no more, and Sirenia just breathed in through her nose from stress. She paused the song, and in response, the created ice vanished from the material universe. And with it, so did Jimmy. A natural response. Song effects only existed as long as the song, and they had a habit of taking any foreign matter with them when they vacated this dimension. It was something even Zero Beat’s brightest had yet to fully understand to this day. His seat on the VIP couch was now vacant, with only his half-empty drink being any proof of his previous existence. Satisfied, Sirenia sat down in his place, remarking at the mess that was the supposed organization of this room. She took his drink in her hand, taking a small sip only to twist her lips at the sour and awful taste of hard liquor. Then she made a somewhat unlikely smile, as she wondered to herself over her brother’s surprising triumph. It would be the second one for him today. Mercy was not completely beyond her, and for today, she would allow both Calvin and Michael their minuscule victory. But Sirenia had time, and the last thing she needed was dwell on past mistakes. More than anything, she wondered over his supposed song effect. To fuse with another Music Master was something unique, to say the least. When she eventually saw him again, when the time was right, Sirenia knew that particular song effect would require further study for sure. The PureBeats would have to wait, unfortunately. It seemed that the universe had a different cosmic arrangement in mind for now. It was somewhat surreal to be sitting so comfortably in the Sound Loft again. Of course, Calvin couldn’t truly relax as he listened to the conversation around him, which also happened to be about him. Kim had stared him down with venomous eyes this entire time, and she made no effort to hide the vitriol in her voice. Calvin held back the urge to sigh as he allowed them to converse around him. True to her personality, Kim had been moments away from pummeling him when she first saw him at the door behind Michael. If Michael hadn’t been there to talk her down, Calvin was sure he’d be on the street with a concussion by now. In a seat nearby, Aeris sat with an unsure expression on her face. She’d said nothing to him as of yet, and he’d been unable to work up the courage to say anything to her. He could only hope that she might offer him some sort of support, despite being the only to actually physically lay a hand on him before his departure. “I was in his brain, Kim! And I’m telling you that I know he’s sorry about everything. Right, Calvin?” Michael said, now asking him directly. Calvin could only offer a somewhat nervous smile in response. “I know. I know, Kim.” Calvin replied, swallowing his fears as he addressed everyone. Aeris looked on with anticipation as he spoke, his tone as genuine as humanly possible. He laughed to himself as he thought over everything in the last few weeks. Calvin smiled, and he eyed Aeris in particular as his words flowed out like water. He leaned back, allowing his words to settle in the air. Kim plopped back in her seat, arms crossed as she thought it over in silence. As much as she wanted to shoot him down, it appeared she was unable to do so for the time being. Next to Calvin, Aeris seemed to be thinking in a similar vein, only for her voice to become more pleasant as finished analyzing his words in full. Calvin was beaming now, his heart beating fast in his chest at Aeris’s words. “I mean, you’re kind of homeless now. I saw it in your head.” Michael pointed out. Calvin had to hold back a grimace. He could only wonder how much else Michael had seen and thus might inevitably reveal. For a moment, there was an awkward silence as all four of them seemed to be at a loss of what to say. But only for a moment, as Aeris proceeded to relay the most unlikely of statements. “You can stay with me. The guest room at our place is always free. My brothers won’t mind. Heck, they might even like you.” she declared with a smile, standing up and stretching her somewhat tired limbs in the process. Without thinking, he suddenly hugged her in front of everyone. Aeris’s face lit up with red as she was caught completely and utterly off guard. For a good five seconds, they stayed embraced, only for Calvin to pull away once he’d realized how much he’d invaded her space. But even still, with their faces only a few inches away from each other, Calvin couldn’t help but wish he had some way to get rid of Michael and Kim at such a convenient time as this. As far as he was concerned, he could look into her bright eyes forever. “We’re still here, you know.” Kim unfortunately interrupted, causing Aeris to finally break away and compose herself. Calvin looked back at Michael, and for the first time a long time, they were in perfect agreement. And when Calvin thought this moment couldn’t get any brighter, he felt a sudden warmth as black-gloved fingers entwined around his own. Next to him, Aeris was honest and kind as always. “I knew you weren’t completely hopeless.” she said, her voice heavenly and sweet. Calvin just scratched the back of his head and laughed. It was strange, but on some level, Calvin could feel himself living as if he’d already lived. He’d used what he’s been given, and now thoughts of a future of riches with the PureBeats seemed like a lifetime away. He wondered on his grandfather, and on his sister. The thought crawled into his mind of what she might do with the knowledge that Michael was alive, when Zero Beat clearly thought him dead. Then there were eight years of memories he’d never get back. As she had promised him, Calvin would never know his parent’s faces, or their touch, or their voices within the memories that had once roamed his mind. So much of his life was missing. So many puzzle pieces lost. But when he looked around him, at his friends in the Sound Loft, he realized that the past had become almost meaningless now. There was a future for him among the Audio Knights, and people who trusted him when he’d done everything to prove otherwise. Calvin smiled, almost cracking from the wealth of emotions, but above all, he promised himself he wouldn’t shed a single tear. Eight years of memories would be made up in the future that Calvin Altberg would build for himself and his friends. Because right here, right now, it was about time for him to get busy living. And finished. This was a rather nice redemption arc for Calvin. Thishe family politics weren’t as in depth as I’d normally like, they served their purpose and were a rather good catalyst for Calvin to change. And you’ve managed to give me two new favorite songs as well, so that’s a plus. Good to hear. I imagine you’ll enjoy the next arc in particular. What were the songs if I might ask? Get Busy Living and We Come Together. I love both of them now because of you. Awesome. Goldfish is classic for sure. 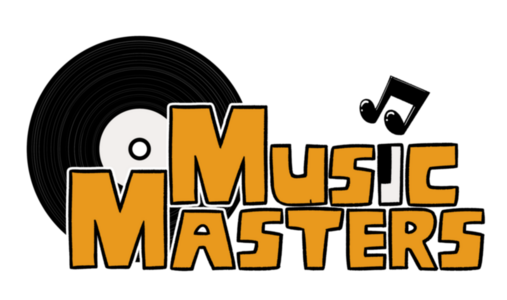 We… are the Music Masters! And if you think we can’t, we’ll always find a way! Michael! Aeris! Kim! And… Calvin! Oh, that’s what you think. Ignorance is bliss.